It started as just another news day, a day in which Michael Jordan’s return to professional basketball was being touted as the top story at the morning news meeting, but in 20 minutes it changed from mundane to monumental. The first plane crash into the World Trade Center broke up the news conference in Atlanta and sent CNN scurrying to cover what appeared to be one of the most bizarre plane accidents ever. The second and third crashes turned America’s world upside down and tested the resources and journalistic skills of CNN’s news operation. For the next two hours, the international news operation would attempt to make sense of senseless acts of violence. It would pull film footage from its own cameras and those of stations in New York and Washington with which it had cooperative agreements. It would search for witnesses to the two crashes in New York and to the one in Washington, interview past and present governmental officials who had expertise in plane crashes and in crisis management, begin the process of scheduling guests with expertise in terrorism, examine footage of collapsing towers and try to determine how many people were dead and injured. In the process, it would disregard some of its guidelines for coverage of events, make several hundred split decisions with inadequate data, speculate on what might be happening with far too few facts and, incredibly, still provide the American public with a balanced and overall accurate sense of what was known. 1. Who served as sources, what basic topics did sources address, how were sources used to clarify events and how were these individuals described to the viewing audience. 2. What kind of analysis or speculation was used, when analysis was introduced, what purpose analysis served and how much time was devoted to analysis and speculation compared to the presentation of facts. The code also states journalists should test the accuracy of information from a variety of sources, exercise care to avoid inadvertent error, and distinguish between advocacy and news reporting. Analyses and commentary should be labeled and not misrepresent fact or context. But finding sources that have correct information is difficult in a crisis, particularly so in a crisis that affects the nation’s two most important cities and sends the government into hiding. News organizations must balance between the public’s need for fast information and the journalist’s need for verifiable information. During a national crisis, the mass media provide a ready communication channel (Graber, 1980) for government officials to address the public. Research shows that a large proportion of sources are government officials. Nimmo and Combs analyzed network coverage of six previous crises from the start through the time the event was no longer receiving continuing on air coverage. They found that between 41% and 60% of the sources quoted were public officials and between 13% and 37% were average citizens. With regard to September 11, WestGroup research (2001) found that almost 60% had no complaint about the news coverage on the broadcast and cable networks. Thirty six percent of the viewers mentioned they felt the coverage was accurate. CNN viewers particularly praised the network’s commitment to continuous coverage. Those who were somewhat critical mentioned repetition of information and pictures or found the coverage too sensational in nature. The Pew Research Center (2001) found 89% of those it surveyed gave the media a positive rating. Americans watched the crisis coverage around the clock and 63% said they were addicted to the coverage, even though it made them sad, frightened and fatigued. The methodology for the study includes two approaches: A quantitative content analysis of the first 119 minutes of CNN coverage and interviews with CNN news executives. The content analysis of CNN’s coverage was used to identify trends and tendencies in the coverage. The interviews sought to determine whether there was a correlation between what content analysis showed had happened and what the news executives said they intended. The study is a part of an ongoing project by the Reilly Center for Media & Public Affairs at The Manship School of Mass Communication, Louisiana State University, of how the networks covered the September 11 crisis. The total project involves 12 faculty members. The project has interviewed key news executives and reporters at all five networks and currently is coding data from all five networks. This study focuses on a subset of the information currently being collected and analyzed. News stories are the consequences of a reporter’s news judgment, interaction with both purposive and non-purposive sources and decisions by news editors on how the story should be reported. Content analysis offers an indispensable foundation for a multidimensional look of the news coverage and for further analysis of sourcing and speculation. We examined the first 119 minutes of coverage of CNN, starting at 8:49.50 a.m. on 9/11. News footage was acquired through Vanderbilt University’s video library. The study unit is the news story. The story is defined as a group of studio and field shots that specifically address one topic or issue and run consecutively. The story can start with or without a lead from the anchor and can be solely reported by the anchor or a reporter. The actual news coverage ran consecutively without clear segments. For the purpose of content analysis, the following cues were used to identify a story: a switch from the anchor to the field reporter or vice versa, a chance in scene, and the voice-over of a different reporter. If the anchor or reporter started reporting on a different aspect of the event, and the coverage of the new topic ran at least 30 seconds, we coded the new topic as a new story. Actual stories identified ran from 30 seconds to 12 minutes. A total of 86 stories were identified in the first 119 minutes. The recording unit of the content analysis includes words, phrases, sentences, and themes identified for measuring attributes in the coverage. Source use was recorded according to the frequency that the name of a person or an organization was associated with direct or indirect quotes. Coding procedures also included identifying the topics and key issues in the coverage. Time allocation was recorded as time elapsed. Five coders were trained using a unified coding protocol following the prescribed procedures by Daniel Riffe et al. (1998). Ten percent of the coding content was used for intercoder reliability check. Scott’s Pi was used to test the intercoder reliability for nominal variables; Pearson’s correlation coefficient was selected for interval and ratio variables. The result of the tests showed intercoder reliability for the nominal variables ranged from .78 to .96; and for ratio variables from .82 to .92. The content of the first 119 minutes of CNN 9/11 coverage was coded by one of the coders after satisfactory intercoder reliability was established. In order to understand the factors influencing television networks’ content on Sept. 11, 2001, the researchers interviewed ten CNN staff members including managing editors, producers, anchors, guest bookers and reporters. The interviews were conducted in the interviewee’s newsrooms, using a flexible, semi-structured questionnaire containing eight general, open-ended questions and allowing interviewees to talk freely about anything that they found important in connection with the 9/11 coverage. The interviews had an open-ended schedule, lasting between 20 and 40 minutes. They were recorded, transcribed and analyzed to identify themes and issues. Thirty eight percent of the stories on CNN during the first 119 minutes focused on the disaster scene at the World Trade Center and 16 percent were focused on the Pentagon (Table 1). Key issues identified from the stories were description of the incident (49 percent), severity of the disaster (16 percent), terrorism (9 percent), and U.S. government reaction (9 percent) (Table 2). Presentation of fact dominated the coverage, with 86 percent of the stories focusing on facts and 10.5 percent on analysis. Similarly, 82 percent of the coverage time was devoted to fact presentation while 18 percent was devoted to analysis. Coverage devoted to other two orientations — consolation (easing stress and anxiety of the audience) (1.2%) and guide (leading the audience through a crisis) (2.3%) — was negligible. Two major sources were used: government officials and witnesses of the incident. Ten percent of the stories used government officials as sources, while 24 percent quoted witnesses (Table 3). When government officials were used as sources, the stories addressed issues regarding government reaction and policies. Key issues associated with government sources include terrorism, reaction and rescue efforts. When witnesses were quoted, the stories focused mostly on what happened at the World Trade Center and Pentagon. Key issues associated with witnesses were recounts of the incident and the severity of disaster (Table 4 & 5). * Frequency and Percentage reflect how each source was used in 86 stories. Sources were not identified in some of the stories and thus total frequency does not add up to 100 percent. The two-source rule that a journalist normally lives by was an early casualty in the first two hours of coverage by CNN. It was replaced by what the camera could see through its lens and with an arrangement where the correspondents passed along information with a disclaimer that they could not verify the accuracy. While this arrangement resulted in some inaccurate information being aired, it also allowed CNN to keep viewers constantly updated with the latest information in a fast unfolding drama that had more twists and turns than an Agatha Christie novel. The pressure of the drama, the sheer magnitude of the event, perhaps coupled with the inability to adequately source all information, made CNN extremely cautious in its reporting. It relied heavily on eyewitness accounts in New York as coverage began but moved more into governmental sources in the second hour of coverage. An analysis of the first two hours and interviews within CNN confirm the network was careful to insure that critical information was attributed to trustworthy sources. As an example, even after the second plane hit the second tower, its correspondents did not voice what everyone knew at that point – that this had to be a terrorist attack. Instead, CNN used live coverage from WNYW where a reporter called the second crash deliberate and followed immediately with a telephone interview with Ira Furman, former chairman of the National Transportation Safety Board. Furman was the first governmental official on CNN to suggest that two crashes into two towers within 20 minutes likely were deliberate acts. CNN also was cautious regarding the word terrorism. CNN first quoted the AP as saying the FBI was investigating the two crashes and that there was a report of one plane hijacking. It followed up with an interview with CNN correspondent Kelli Arena on the FBI investigation in which Arena said the FBI had not determined if this was a terrorist act. Finally, the Associated Press reported that an unnamed government official was calling the two crashes an act of terrorism. CNN broadcast that report, attributing the information to AP. It was not until nearly 9:30 a.m. – 40 minutes after CNN first began its coverage – that its own correspondents began reporting that this was terrorism. Speculation, likewise, was limited in the first few hours to logical analysis based on what the correspondents could personally see. One factor discouraging speculation was that no one knew for certain what had happened – or was happening. CNN coverage began with the assumption that there had been a plane crash – albeit a most unusual crash – but 20 minutes into the coverage, that assumption was proved false. By the end of the first two hours, two planes had crashed, two towers had collapsed, another plane had ripped open a five-story-high hole in the Pentagon and a fourth plane had crashed in Pennsylvania. It should be noted that CNN, more so than any other network, is designed for coverage of breaking news events of this magnitude. Unlike the broadcast networks, which are geared toward production of a 30 minute evening newscast, CNN is a 7 day a week, 24 hour a day news operation. In addition, CNN developed years ago a series of non-exclusive arrangements in which television stations in a market agree to provide CNN with camera footage and reportage even as they provide similar footage to their own network, such as CBS or ABC. In return, CNN shares its coverage with those stations, giving them a choice of the reportage from their network affiliate or from CNN. And then, of course, there is the advantage of being an international news operation with contacts around the world. CNN actually is seven different networks housed in one building. Each of those networks – Europe, Asia, Latin America, for example – has its own separate fully staffed newsroom. CNN questioned within minutes of beginning its coverage whether the first plane crash was an accident but did so in a way that posed the question without giving an answer. This left it to the viewer to decide whether this might be an accident or a purposeful act. Sean Murtagh, a CNN vice president for finance who happened to witness the crash, was the first eyewitness on CNN. He identified the plane as a twin engine jet, possibly a 737 passenger jet. He informed viewers that the normal flight paths for commercial aircraft would not bring planes near the World Trade Center, relying on his own experience as a frequent flier between New York and Atlanta. But his speculation ended there, leaving it to viewers to draw their own conclusions from that piece of information. 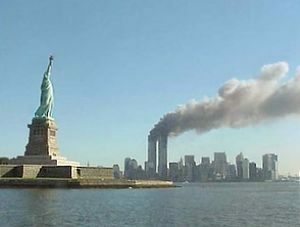 The non-exclusive arrangements with other stations quickly came into play, when CNN picked up an eyewitness account provided by WNYW, and then tapped into a live feed provided by WABC in New York when the second plane hit the second tower. There were several missteps in the first two hours, some by CNN correspondents and some by reporters working under the non-exclusive arrangement and providing information to CNN. For example, a reporter on the scene for a New York station at the time of the second plane crash originally described the commercial aircraft as a small plane, perhaps a propeller plane. Shortly after the Pentagon was hit, CNN reported there was a fire on the Mall in Washington. It announced it had a report that a car bomb had exploded at the State Department in Washington. It reported that it had received information that a second plane was headed toward Washington and the Pentagon – apparently the plane that crashed in Pennsylvania after the passengers revolted against the terrorists. And it announced that there was a report of a fire at the State Department. Factual errors such as these frequently occur in a chaotic scene. Reporters are only as good as their source of information and, in a crisis, sources of information often are rattled, harried and not very accurate. Overall, and on the big issues of the day, CNN’s information was correct. Overall, it attributed information when it could and identified unconfirmed reports as being unconfirmed. The caution that CNN showed in sourcing in the first two hours continued throughout the day. The Bookings Department was careful in selecting guests brought in as expert commentators, said Joy DiBenedetto, vice president for Network Bookings at CNN. “We don’t want to put somebody on the air that says something that’s premature or somebody that doesn’t have all the facts,” she said. “We vet people very closely and, in a time like 9/11, we did discuss, you know, who’s the right person to put on.” Sometime between the first and second hour of coverage, CNN News Chairman Walter Isaacson met with the Bookings staff. He “wanted to sit down at a table and brainstorm about it,” said Gail Chalef, managing editor for Network Bookings. The Bookings Department also tried to feel out prospective interviewees before turning them over to a correspondent for the actual interview. The goal was to have a general idea of what the guest or the interviewee might say before putting them in on the air. Many foreign leaders were interested in talking and CNN often took live feeds on those interviews, often done by CNN International reporters, said Tom Fenton, vice president and deputy managing editor of international news at CNN. The interviews then were turned around for airing on the CNN domestic network. CNN first gave out unsubstantiated information under its own name about 45 minutes into the coverage when it reported that one of the planes that hit the World Trade Center was an American Airlines flight that was diverted from Boston. It gave no source for the information. CNN Anchor Aaron Brown also informed the audience that there were reports that as many as 1,000 people could be injured. His cautionary note provides an example of how CNN was careful in passing on unattributed information. The policy Brown followed also was articulated by Gary Tuchman, a CNN correspondent who drove from Atlanta to New York overnight. “In an emergency situation like this, you can’t go by a hard and fast two-source rule. But you need to let your viewers know that. In a situation like this, you have to be honest with the viewers, you don’t have all the sources…because it’s chaotic, there’s no one in charge,” Tuchman said. The final curb on sourcing and speculation came from editorial decisions in the control room. CNN executives often decided on the spot whether to release certain information or show certain pictures. Most of CNN’s brain trust, from Isaacson to former News Chairman Tom Johnson to executives from AOL, the parent of CNN, assembled in the control room during the first hours of coverage. This made it easy to get a consensus on what information to release and which pictures to show. In some cases, the balancing act was not over the credibility of the information or the suitability of the pictures but over whether the information could be kept in context if it were released. McAlister said in the final analysis, however, all the journalistic rules in the world and all the snap editorial decisions in the control room have to take a back seat to the one indefinable quality. CNN’s coverage for the first two hours of 9/11 was tightly focused on hard news with analysis limited to explaining what the camera showed. Witnesses and present and past governmental officials were used almost exclusively as sources of information. Witnesses, obviously, were used to provide descriptions of the incident and physical damage. Governmental officials were used to talk about governmental reaction, terrorism in general and rescue efforts. Rules for sourcing were relaxed and this may have resulted in some mistakes in early coverage – car bombs at the State Department, fires on the Mall, etc. — that could have been averted. However, the amount of unattributed or unsubstantiated information used on CNN was limited. Experts brought on the air to provide commentary were primarily former or current governmental officials. The cooperative arrangements CNN has used for years was of vital importance in getting pictures and commentary from non-CNN reporters on the scene, thereby adding levels of texture to the coverage that would not otherwise have been possible. B. H. Westley and M.S. Jr. MaClean, A conceptual Model for Communication research, Journalism Quarterly, 34, 31-38, 1957. Daniel Riffe, Stephen Lacy and Fred Fico, Analyzing Media Messages: Using Quantitative Content Analysis in Research, Lawrence Erlbaum Associates, Mahwah, NJ, 1998. The actual content coded for a larger scale study is the first 8 hours of the network coverage of 9/11 incident. The content for this study is part of the larger scale study. The actual content used for intercoder reliability test is about one hour of the news coverage from two network stations: CNN and ABC. Atkinson, Emily. (2002, January 24). Personal interview, Editorial Producer, CNN, Atlanta. Chalef, Gail. ( January 24, 2002 ). Personal interview, Managing Editor Network Bookings, CNN, Atlanta. Charles, Cory. (January 24, 2002). Personal interview, Director International Guest Bookings, CNN, Atlanta. Graber, Doris. (1980). Mass Media and American Politics. Washington D.C.: Congressional Quarterly Press, pp. 225 – 241. McAllister, Keith. (January 24, 2002). Personal interview, Senior Vice President and National Managing Editor, CNN, Atlanta. Morris, Stephanie. (January 24, 2002). Personal interview, Futures Editor, Network Bookings, CNN, Atlanta. Mercure, Liz. ( January 24, 2002). Personal interview, Supervising Producer, CNN, Atlanta. Network News. Knoxville: The University of Tennessee Press. The Pew Research Center. (2002, February 23). American Psyche Reeling from Terror Attacks. <http://www.people-press.org/reports/display.php3?reportID=3.html> February 28, 2002. Tuchman, Gary. (January 24, 2002). Personal interview, National Correspondent, CNN, Atlanta. WestGroup Research. (2001, September 24) Americans Believe Attack on America TV Coverage Accurate; Anchors Professional. Press Release. < (February 28, 2002). READ 9/11 Mystery Passengers Exposed!! !